Wedding cakes for celebrities are elaborate, decadent confections that threaten to steal the show from the glitterati guest list, runway wedding fashions, and elaborate festivities. Any couple can have a celebrity-style wedding cake with a little planning and creativity. Celebrities are always in the spotlight, whether it is for a new blockbuster film, an annual awards show, or a gossipy scandal. Because celebrities are so popular, they have become trendsetters in clothing, jewelry, hair styles, and other fashion. Celebrity weddings are the ultimate in extravagant luxury, and celebrity wedding dresses, locations, and cakes are often talked about for weeks before and after the event in entertainment magazines and on showbiz news shows. Most couples realize quickly that they may not be able to arrange the customized designer wedding dresses, lavish guest lists, and exotic wedding destinations of celebrity couples, but the sweet deliciousness of celebrity desserts isn't as out of reach as many couples may think. Celebrity cakes have as many variations in flavor, style, and wedding cake design as any other aspect of wedding festivities, but what types of desserts do the rich and famous enjoy? Donald Trump and Melanie Knauss chose a decadent seven tier orange Grand Mariner cake decorated with 3,000 white icing roses. The amazing cake stood five feet tall and weighed an estimated 50 pounds. When Tom Cruise and Katie Holmes exchanged vows, they celebrated with a five tiered tapered ivory cake with marzipan rose and bead decorations. The white chocolate mousse was both elegant and delicious. Pierce Brosnan and Keely Shaye shared their first bite of married life with a rich six tier carrot cake decorated with cascades of roses, orange blossoms, and gardenia blooms. Jessica Simpson and Nick Lachey chose a classic red velvet cake with five hexagonal tiers decorated with delicate sugar paste flowers. LeAnn Rimes and Dean Sheremat opted for a luscious white chocolate and strawberry cake with five tiers stretching a full five feet tall. The white icing was accented with more than 400 red roses that separated the tiers and served as an elegant wedding cake top. When Marcia Cross and Tom Mahoney exchanged vows, they also exchanged bites of a square wedding cake featuring different flavors on each of its five tiers. Roses and other flowers created a romantic pink palette for the cake's design. Blair Underwood and Desiree opted for an Eiffel Tower wedding cake complete with interior lighting along the tower's frame and a custom figuring of the couple inside the tower. The Star Jones and Al Reynolds spectacular wedding was highlighted by the 10 foot tall wedding cake decorated with pink, blue, and white flowers, including roses, orchids, and tulips. Toni Braxton and Keri Lewis had afour tier square design in characteristic Tiffany blue accented with icing ribbons to simulate Tiffany gift boxes. Carmen Electra and Dave Navarro opted for a rich four tier, multi-flavored cake that included Oreo cheesecake, chocolate, and strawberry shortcake flavors decorated with real Swarovski crystals accenting red roses. 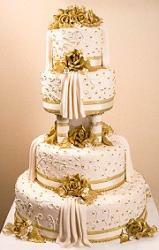 For pictures of famous celebrity wedding cakes, visit Wedding Sutra. Size: Celebrity cakes are generally grandiose and larger than traditional cakes. 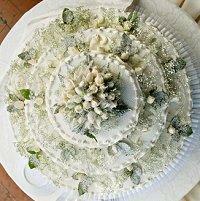 Couples can create several faux layers with matching icing to simulate a larger cake on their non-celebrity budgets. Flowers: Flowers are the preferred decoration for elegant celebrity cakes, and they are easy to use for any wedding cake. Simple wedding cakes with fresh flowers have instant celebrity elegance, or couples can choose floral cascades, tiers, or intricate sugar flowers to adorn their cake. Flavors: Rarely will a celebrity couple opt for basic flavors - more unique flavors are preferred. Liqueurs, chocolate wedding cakes, and multiple flavors add stardom to the dessert no matter whose it is. Customization: Customizing a cake with gold leaf, crystals, monograms, and other details makes it stand out just as much as the famous newlyweds. Any couple can add these types of personal touches to make their cake more unique and special for their celebration. Toppers: Most celebrity couples do not choose basic bride-and-groom wedding cake toppers; flowers are the preferred option and are easy for any couple to arrange. By understanding these trends, any couple can easily create their own celebrity-style cake. Scale down a celebrity-style cake to a smaller and more budget-friendly confection without sacrificing style. 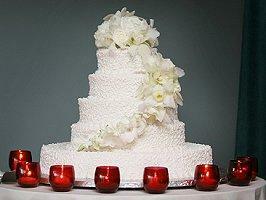 Opt for silk wedding flowers or silk rose petals to decorate the cake more cheaply than with real blooms. Order the cake well in advance to avoid rush fees. Investigate faux cakes or layers for the visible design but augment the number of servings with much cheaper sheet cakes or wedding cupcakes. Consider eliminating extra desserts or simplifying other decorations and details to save money for a more expensive wedding cake. Celebrity wedding cakes are towering confections that become nearly as famous as the couples they unite. By understanding celebrity cake trends and how to replicate them, any couple can create their own delicious cake to be the star of the reception menu.